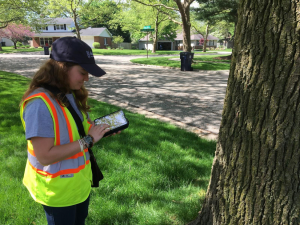 Katelyn DeWitt takes the measure of Holland’s tree resources as part of the City of Holland Urban Tree Canopy Inventory. This summer I have been walking around Holland doing just that. In a joint project between the City of Holland and Hope College, I have been working to census all of the trees on public property in Holland by recording every tree’s trunk diameter and species. I am also assessing them for the ecological benefits that they provide to the community. 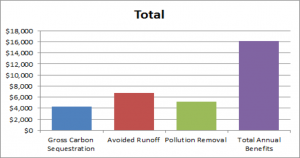 Using the information I collect, and with a software tool called iTree, I have been estimating the amount of carbon sequestered, the air pollutants removed, and the water runoff intercepted by any individual tree. 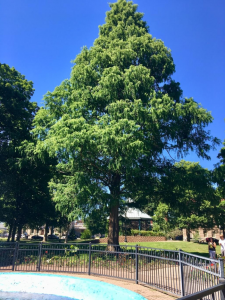 For example, a dawn redwood in Centennial Park with a diameter of 38 inches is estimated to sequester 39.6 pounds of carbon, prevent 55.5 cubic feet of water runoff, and remove 25.2 ounces of pollutants every year! This dawn redwood in Centennial Park gives back the equivalent of $8.43 every year. These benefits are estimated to be worth $8.43 every year to the community, just for this one dawn redwood. Moreover, that tree is just one out of 4,000 – and counting – inventoried trees in Holland. The ecological value of the 3,663 inventoried trees is $16,166 every year. When I was walking through neighborhoods measuring trees, people were often concerned and asked me if the city is going to cut down their tree, but that was not the case. Instead, unless the tree is diseased or poses a threat, the goal is to let them grow larger, because the larger the trees grow, the more ecological benefits they produce. Holland’s urban forest is vital to creating a sustainable and comfortable environment. The annual ecological benefits of 3,663 inventoried trees in Holland to date are shown in this chart. Understanding that trees enhance both environmental and human health, and making an effort to preserve them, will improve Holland’s environmental impact and attractiveness. By preserving larger trees and planting new ones, Holland residents can make an investment. Over a tree’s lifetime, its environmental benefits far exceed the value of wood that makes up the tree. For example, 30 years from now, that dawn redwood will be able to sequester about 68 pounds of carbon annually. So, while I continue to get to know the trees in Holland, each by name, I encourage you to get to know them too. Plant a tree in your yard. Some great trees to consider, based on their ability to provide environmental benefits, are honey locust, river birch, northern hackberry, silver maple and swamp white oak. If you want to know how many benefits a tree in your yard provides, go to treebenefits.com. Finally, appreciate the beauty, clean air, the lower electric bills, soil stabilization, flood reduction, and other benefits that our trees provide. So, go hug a tree, for they help create a beautiful, sustainable, and healthy community.  Hope College student Katelyn DeWitt this summer was research assistant for the City of Holland Urban Tree Canopy Inventory Project overseen by Dr. Kathy Winnett-Murray and Dr. Greg Murray of the Hope College Biology Department.